Homemade Goetta!!!! You must try it!!! Heading to Pittsburgh today with a friend of mine to visit his Dad, and I thought it would be fun to make Goetta for them, since they had never had it. We are making when we get there so I thought I would re-post this for today, its going to fun trip, I will post about it!! Everyone have a great day!! Enjoy!! What is Goetta, that is the question I got the most from my friends that are not from this area (Greater Cincinnati/Northern Ky area) when I told them I was going to blog about Goetta. Now in my house I felt like when we had Goetta is was a breakfast treat, we didn’t have it all the time and usually only in the wintertime. Goetta is a breakfast sausage of likely German-American origin that is popular in the greater Cincinnati area. It is primarily composed of ground meat (pork, or pork and beef) and steel-cut oats. Pronounced gétt-aa, ged-da or get-uh Americanized pronunciation, this dish probably originated with German settlers from the northwestern regions of Oldenburg, Hannover, and Westphalia who emigrated to the Cincinnati area in the 19th century. 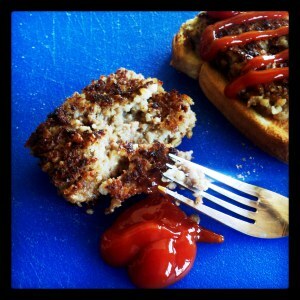 The word “Goetta” comes from the Low German word götte. That would be kind of funny in this area to have someone named Goetta 🙂 LOL! !